The former Secretary-General of the United Nations passed on 18 August 2018 in the presence of his family after a short illness. Annan was 80 years old. Kofi Annan was born on April 8, 1938. He spent most of his working life at the United Nations. In 1997, the Ghanaians became the first African-born politician to be UN Secretary-General. Five years later, he had earned such a reputation internationally that his re-election was undisputed. As a representative of Ghana, he has taken a special responsibility for the interests of Africa. In addition to numerous awards, he received in 2001, together with the United Nations, which he ran between 1997 and 2006, the Nobel Peace Prize. In the ten years at the head of the United Nations, Annan was considered the moral conscience of the world. He campaigned with charisma and diplomatic skill for the poor and oppressed, campaigned for peace and justice, and defied the US in the dispute over the Iraq war. 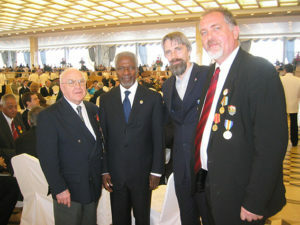 In May 2005, former FIR President Michel Vanderborght, former FIR Vice – President Vilmos Hanti and Secretary-General Dr. Ulrich Schneider met with Kofi Annan and have had a short exchange of views. Even after ending his role as UN Secretary-General, Annan continued to work for international peace efforts. For almost six months, Annan, as a UN Special Envoy, sought to find a solution to the Syrian conflict and to bring the war to an end – unfortunately without success. Kofi Annan was a diplomat who dedicated his life to a more just and peaceful world. As a diplomat, he has moved many people with his deep compassion and empathy. He was an inspiration for young and old.